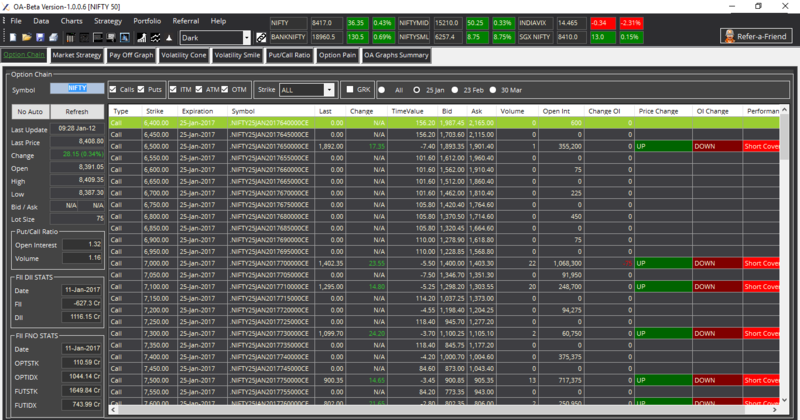 Just upgraded Option Action Beta Version from 1.0.0.5 to 1.0.0.6 and the new interface is cool and interesting filled with meaningful addition which is essential for a trader. It has a cool dashboard with Nifty, Bank Nifty, SGX Nifty, Small Cap, Mid Cap, India VIX. Introduction to Option Action – Video Tutorial In this video tutorial we will explore the basic features and functionalities of Option Action, How to create option strategies and how to interpret the payoff graph. this is the best desktop application which I have ever seen. I am a derivative trader and real time greeks are very useful for hedging. I want to suggest some more stuff. 2.Make this option action for andriod mobile application so that we can use it anywhere, anytime.